I spend my time solving problems. PROBLEMS ALWAYS STAND IN THE WAY OF PROGRESS. Problems hold you back, distracting and sapping energy and focus. 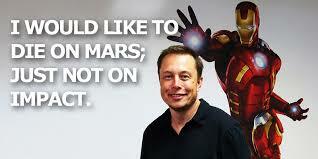 Elon Musk understands the tension between problems and progress. If you just keep talking about problems, you stay right where you are. Only when you solve your problems, can you move forward. ELON MUSK WAS BORN IN SOUTH AFRICA IN 1971 and purchased his first computer at age 10. He taught himself to program and two years later sold a game he created for $500. Musk studied at Queen’s University in Canada and later at University of Pennsylvania. He then headed to Stanford University to pursue a Ph.D in energy physics but left after just two days to join the Internet boom, launching his first company, Zip2 Corporation, an online city guide which he later sold for $340 million. A multimillionaire in his late 20s, he then founded X.com in 1999 (later known as PayPal), SpaceX in 2002 (space commercialization), Tesla Motors in 2003 (electric cars, powertrains, and batteries), and Solar City (residential solar power and solar installations). Today at 44, his net worth is $12 billion. He has made major contributions to the environment, renewable energy and energy storage, space commercialization, internet finance and transportation.